The Adirondack mountains hold a special place in my heart. Aside from being beautiful and close, I've had many a great adventure there. Until the past year or two, most of my adventures in the High Peaks region had been in warm weather. But there's so much to do in the winter, and so much fun to be had! After a trip up to Keene Valley and Lake Placid this past weekend, I decided I had to do the region's cold weather possibilities justice on the blog! Here are my four favorite ways to guarantee an awesome winter weekend in the High Peaks. George showing us how it's done with one tool*. We parked at Chapel Pond and started the approach, which took us around the edge of the pond through knee deep snow and into the sparsely forested canyon. Our destination was Positive Reinforcement, a beautiful NEI 3+/4- flow that can, as we discovered, accommodate three parties and four ropes. Our group leader led right up the center of the formation and set up two top ropes for us to work on throughout the day. The first climb, set up on the far right side of the flow, was the easier of the two with plenty of stemming and resting opportunities. The second, set right in the middle, took us over a more sustained vertical section. I had to feebly yell "take!" to my belayer near the top of the second climb as the predictable pump and panic set in. 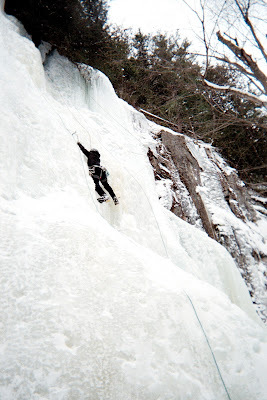 Someday, I'll be able to climb 90' of ice without panicking! Two other pairs of climbers came in and set up in between us. Watching one party forgo ATCs for hip belays and Munter hitch knots made for some interesting conversations. *I bet George, our group leader, a beer that he couldn't climb the whole pitch with one tool. I upped the ante to a six pack if he could do it without falling. He fell once. Only one beer for George! While in the vicinity of Lake Placid, it seemed silly not to visit Whiteface Mountain. 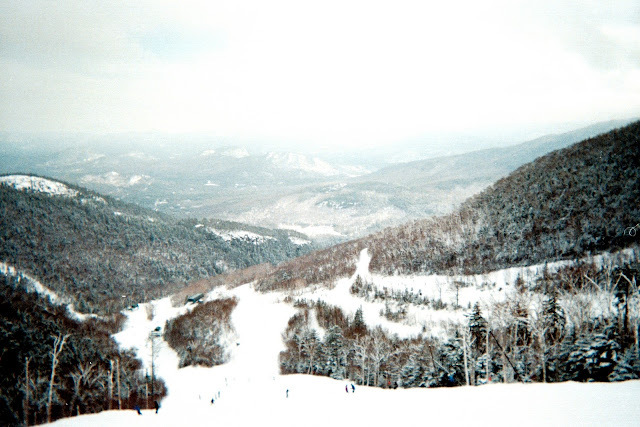 With a 3,000 foot vertical and 86 trails, it's one of the best skiing destinations on the east coast. Not to mention, of course, the fact that it's dubbed the Olympic Mountain after being home to the 1980 Winter Olympic Games. Whiteface is a beautiful mountain with terrain appropriate for all levels of skiers and boarders. My favorite runs are the long, meandering Wilmington Trail and the short blue square Silver Glades. Every resort should have a blue square glade run, in my humble opinion. I love zipping through the trees, but only when I'm sure I won't crash into one! A cloudy, but beautiful day at Whiteface. This was my second trip to the mountain, the first being in March of last year. Conditions were less than ideal; it was a busy day and most of the runs were incredibly icy. From what I've heard, this is pretty typical of the mountain and of course, typical of east coast skiing. The runs we did were pretty well skied off and all the snow had been packed into giant randomly placed bumps. My advice: get there early on busy days or visit on a weekday if you can. But the views were just as I remember - beautiful! Aleya approaching the summit of Algonquin. 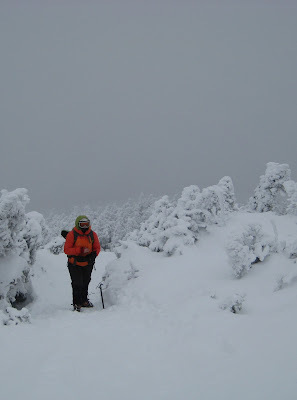 The Adirondack High Peaks region is a perfect place to learn and practice winter hiking and mountaineering. Last year, Aleya and I summited Algonquin (5,114') during a three day mountaineering course with the Eastern Mountain Sports Climbing School. The hike took our group of four 6-7 hours to complete and we summitted in howling winds and sub zero temperatures. After climbing a few High Peaks in the summer, it was amazing to see what the tops of the mountains look like in winter! While our group was out ice climbing, Cornell swimming friend Jayme was out tackling Mount Colden (4,714'). Jayme and husband CJ are well on their way to becoming 46ers - an elite group of adventurers who've climbed the 46 highest peaks in the Adirondacks. Armed with snowshoes, Jayme and her group set off from the Adirondack Loj and hiked 11.2 miles round trip to the summit and back. Jayme reports, "It was a really nice day; just the right temperature. Not so warm that we overheated in our layers, but not so cold that we felt we had to tag the summit and make a madcap dash back down for cover from the wind in the trees. Views from the summit were minimal, but the hike up the mountain was very pretty, with so much undisturbed snow. I would love to find a sunny winter day to go back up. It would be stunning." Jayme and CJ chronicle their ADK 46er adventures at Paperchasers Gone Wild. Lake Placid played host to the Olympic Winter Games twice, once in 1932 and again in 1980. If you're not up for climbing mountains, skiing, or climbing ice, some of the Olympic facilities and activities in town are perfect alternatives. Drive out of town to the High Peaks Information Center to learn more about the region. And of course, be sure to visit the Lake Placid Pub and Brewery for their famous Ubu Ale. If you've been to the High Peaks in the winter, what are some of your favorite activities? Have you participated in any mentioned above?